By sabine, June 22, 2005 at 3:09 pm . Ever since I met Nomeda and Gediminas Urbonas in 1999, two contemporary artists from Lithuania, they have been in search for an art space where they could establish a media lab, host talks and exhibit new media related art works. In August 2004 their organization, Vilma, hosted the RAM 6 workshop in Vilnius–yet another example which showed how well organized they were, and how desperate in need they were for their own infrastructure to do critical and innovative projects. This spring, Nomeda and Gediminas suddenly saw a chance–and grabbed it. 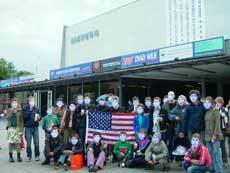 They occupied the huge voyer of the privatized Lietuva cinema, over which a controversy had arisen. In May 2005 Nomeda and Gediminas were in Amsterdam briefly for the opening of the Populism show at the Stedelijk Museum, a moment we used to catch up and prepare for the following interview, which was done through email over the past few weeks. The situation of their exciting project is changing on a daily basis and we’ll hope to keep you informed. In the meanwhile, if you would like to support them, for instance by sending them taping which they could screen, please contact them. Email plus URLs can be found below. Now, in 2005, there is only one cinema standing: LIETUVA. And a battle has emerged to save it. Cinema Lietuva was built in 1965 and, significantly, is the largest cinema in Lithuania with over 1000 seats and a screen size of 200 square meters, offering an ideal image size. It is the home of the Vilnius Film Festival and as such has played an important role in the imaginative life of a whole generation of Vilnius people. The title of the enterprise “Lietuva” (Lithuania) is also an important signifier of national identity, as its name never bore any Soviet overtones (i.e. it wasn’t called the Cinema of the Soviet Republic of Lithuania). To say to somebody “let’s meet at Lietuva” really meant something during Soviet occupation. In 2002, the Vilnius Municipal authorities quietly sold the cinema to private property developers; with a caveat that it had to operate as a cinema for a three-year period. That term is ending on 1 July 2005 and a protest to save the cinema has begun. In March 2005 we infiltrated the former ticket office of the country largest cinema, staging the ‘pro-test lab’, which is the embodiment of VILMA – Vilnius Interdisciplinary Lab for Media Arts. Pro-test lab is constructed as a spatial device to register the scenario of protest and generate an action. The logic of the spatial device refers to the Brothers Lumiere early model of the cinema camera that performed a twofold function both recording and projecting the action. Pro-test lab is generating and archiving all available forms of protest against the situation of the Cinema Lietuva focusing on the discourse of public space vs. corporate privatization. The protest is aimed at reclaiming the now privatized space. The space of the former ticket office is build as separate segment of larger architectural set rendered in grayish stucco. We have got access to such relatively big space (250 square meters), thanks to the fashion of queuing, largely rehearsed in former times. Even after the 1997 renovation the space preserved the charm of a modernist glass pavilion that encloses the ground floor of the whole building, facing to the larger square of one of a main streets in a city. Two glass walls construct the showcase that faces the street unfolding the space to the passers-by and introducing the character that rather resemble the lounge than a white cube or a black box. The white sealing of a space is sliced with strict stripes of neon lights. Three white concrete columns supporting the sealing stand for the right of notation boards collecting on their surface signatures of support and immediate reactions of a visitors. The pro-test lab is fitted with LIETUVA TV, a public access television studio called similar to the national television. LIETUVA TV is a meta-zone that maps new visibilities, and documents and archives the protest. LIETUVA TV develops its own format of a so called Talk Show which creates the media space merging geography of the city and cinematic references that challenge contemporary politics in real time debates, moderated by Rytis Juodeika, a film critic and theorist. ‘Modeling Zone’ is a space for thinking and workshops that architecture student club is staging to invite participants interested to model situations: to produce and project visions of [the] future city. The Modeling Zone is for the construction/development of new housing models and for privatization role-playing games to be played. ASK (the Architecture Students’ Club) has developed a daily street game merging Monopoly board-game strategies with local municipality characteristics in a game show “VIP Turgus” that refers to VP market mall chain-–the owner of the cinema. AViZa (oat) is an alternative kitchen space improvised by young people gathered on a mailing-list to cook the discussions and discuss the secrets of cooking. AViZa invites cultural institutes and agencies to present national cuisines and share their views on city development. The Polyphonic protest program has been developed by Co:LAB UK, an intern student collective from Dartington College (UK) that suggested to do a bar space as the socializing element every Thursday, offering tea, soup and more. As the sign says: ”cast your ballot (a sum not less than 2 litas) in the box and in return you will get beer, wine or water”. The special sound and visual program is developed for each event. Inside the space of the lab in front of the entrance there is an architectural appendix – an additional space of something like 20 square meters separated by a glass wall, that forms a perfect green house. It is filled with plants and lightened with vegetation lights making the area into a playground to rehearse the deejay in the role of the gardener. This is a zone of a radio station in development. 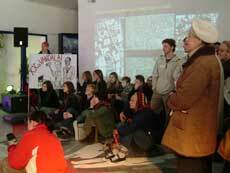 The Reading Room zone is a space which archives and navigates the protest scenario. It contains a footnote library of disobedience and rebellion, collected according the suggestion or donation based on a good will and collaborative spirit of citizens. It gathers all kinds of documents mapping the development of resistance to privatization and gentrification, including some audiovisual documents, web links, collection of news, papers, magazines and books. Reading Room prepares for a screening program of political forms that uses format of films. To bring all the activities together we use an Internet forum. To date, this list has been joined by over 150 people, including architecture students, green party activists, vegans, anarchists, musicians, students from TV and cinema school, animators, film world people, theater students, social democrat party, community leaders, casual passers by and regular hangout goers. Now back to your question. What happened, for instance, last week? We had an action “America will help us”, which staggered protest lab fans with contradictory facets. Referring to the hope of Lithuanians that there is a upper will out there, that can rescuer, this myth was reinforced by American Voice radio propaganda during the post war resistance keeping Lithuanian for the next 20 years in forest to beat the resistance record. On the facade of the cinema the huge banner with black and white layout featuring the words of the President of the United States George W. Bush, that from now on, any enemy of LIETUVA is an enemy of the United States, he stated during a visit to Vilnius on November 23 2002. So the initiators of the action masterly planted the cinema in a place of a country calling everyone who is for LIETUVA, join the action seducing with a popcorn, cola and much more. Together with the United States, let’s save LIETUVA from the enemy! 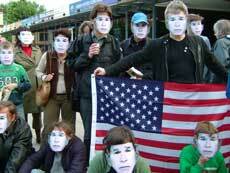 People gathered were supplied with masks of the US president to see the world through the eyes of George Bush. Dean Reed, the red Elvis supported the background of the action with his songs performed by a laptop. For local context of radical thought which hardly accepts leftist discourse due a connotation to Stalinist repressions such turn of a pro-test lab activity was mind blowing. N&G: When we grew up we thought it was great! Absolutely great architecture that brought the urban spirit into the city. It developed the idea of public space, shattering the patriarchal values of soviet state and rural Lithuanian life. It looked western, more Scandinavian maybe, as the scale of such developments in Lithuania was different from Palast der Republik in Berlin. Indeed it was contradicting the baroque architecture and always stood up for something, that encroaches on the very fundamental values. It carried a strong claim for change and the same time for disintegration of the old. When we were kids the cinema was big, new and nice, it had a touch of progressive architecture that brought feelings of openness, of the so-called warming up epoch. Nowadays, despite the grayish and worn out exterior surfaces it remains a strong landmark. It is a document that testifies the desire for public space. From our point it is the best cinema theater in the country. Politicians only think about making profits. They look at the culture as at the milking cow, and the same way they treat public space. New liberals with real estate tycoons meet the expectation of both former communists and former nationalists to erase traces of the soviet past as they did it with the soviet monuments. In a place of a cinema they plan to build huge penthouse with a shopping center on a ground floor. They were not even thinking about building multiplex, as at the moment is not as profitable as speculation with a real estate. N&G: Well Vilnius is not the case. Space is rather controlled. You cannot find any of abandoned space here. Every corner is privatized as there is a lot of Russian money washed here through the real estate business. We are squatting the privatized space now. We call for reclaiming public space and demand for justice, for the right distribution. GL: What’s the cultural politics like in Lithuania? I heard that the Soros structures were dismantled and that this scene will move into newly establish contemporary arts museum. Still, there is little in terms of infrastructure, in particular in the field of new media. N&G: Today, all attention goes to the cultural heritage and restoration. Former communist joined their desires with conservatives to rebuild the old royal castle. It seems like the energies of soviet factory builders suspended during last years of privatization as there was no industry development, now get released into the retrospectives. On the other hand they continue to exercise former soviet experience of national spectacle supporting facade culture. Classical music and theater production, even big national song festivals get all the political attention and support. Another problem that understanding of efficiency in culture or public space is reduced to the monetary level. Indeed, after a few years of lurking in the National Museum the Soros structure came onto the surface in a new embodiment of State Gallery for Modern Art. Seems like the same model is implemented in at least a few of post soviet countries. Its just really sad that in Lithuania in particular the Soros foundation eliminated support for new media initiatives and practices. This is maybe due to their loyalty to national handicrafts and traditional visual culture? Who knows. N&G: We starting from screenings and small scale events like workshops, as education is most important. We would like to collaborate with creative agencies and develop system of hosting and producing international workshops that would sustain the search and development of new media practices. We see VILMA as alternative education and production center. And through that we would also build identity for VILMA and the system of plug-ins including television, radio, library and experimental production including such practices as urban agriculture for instance. Everyone who is interested are welcome to join and propose the support or collaboration. We try to invest into the local context, translating some of seminal writers’ writings on new media as well as encouraging local thinkers to write on media culture at large. Only some of it comes in English, as we cannot cope with translations. The most crucial would be translation support and editing of English. Then we would be needing someone joining voluntary with critical awareness, that could enjoy working in hard conditions helping to build the self sustained structure. Also we ask for support building media library: films, DVDs, CDRoms, web links and texts. And at last but not the least we need an international support letter directed to the Parliament, the Prime Minister, the Minister of Culture, and the Mayor of Vilnius to support our activity and preserve the space for independent cinema and new media practice in Vilnius. The only in the country.